Shield captures an alien artifact dealer, Vanchat, thinking he may know where Centipede is holding Coulson, as the type of artifact he was trying to fence is the same used by Centipede. While Director Hand is debriefing the team, an alert comes up about a breach in the system. Skye is trying to find the money trail from Vanchat to Centipede. Hand wants Skye thrown off the plane, and May agrees that Skye is of no value to them on the plane. Everyone watching (but not Ward and Skye) realize this is a ploy to get her off the plane so she can have free reign to investigate as she pleases. Ward and Fitz/Simmons allow Skye to escape before her debriefing. Skye still has her scrambler bracelet on, so she is still unable to access any type of internet connection. She reads an article in a magazine about a local billionaire (Lloyd Rathman) who is under investigation and decides she can get him to help her. It made very little sense watching, and makes maybe even less sense now. Once Skye gets there she calls Rathman’s office pretending be an officer informing him about his car being stolen and crashed. She urges the secretary to have Rathman come home immediately. This whole plan was to get Rathman to login to his bank account so she can trace where Vanchat’s payments are coming from. I forgot to mention she bought a leather coat at the store so she could pretend to be May when blackmailing Rathman into helping her. What it all boils down to is that she is able to get a location on where Coulson may be being held hostage. Meanwhile, Coulson is being tortured in a dingy old house. Po is trying to get Coulson to tell them what happened to him after he died. Coulson refuses, and would rather die than tell any secrets. Coulson is left alone briefly and manages to escape, only to find himself in an old abandoned ghost town that had been used for nuclear testing. It’s so “House of Wax” right down to the mannequin people filling all of the houses. Po tells him that it is desert for miles, and Coulson is brought back to his room. After starting another painful session with Coulson, Raina appears and questions Po’s tactics. Po says that the Clairvoyant has authorized him to use force. At that moment the Clairvoyant calls Po and asks to speak to Raina. She talks to the Clairvoyant briefly before giving the phone back to Po. When Po puts the phone to his ear, he is somehow attacked and killed through the phone. I guess his method wasn’t working so well. As this is going on, the crew on the plane is able to find a Centipede helicopter in the Mojave Desert, and they change course from Sydney to the Mojave. Skye calls the team to let them know of Coulson’s possible location. At the same time, Raina is trying to convince Coulson to let the machine do its work and dig out his deepest secret. The one that Shield doesn’t want him to know about. Raina needs to secret to figure out how they brought Coulson back to life. That way she can fix her super soldiers if they are killed (or if the kill switch is triggered). Coulson finally agrees after Raina tells him that his ex girlfriend cried for days after she was told Coulson was dead. Memories of a masseuse and a waiter are replaced with the realities of a nurse and a doctor. Coulson is smart enough, however, to just tell Raina that all he sees is darkness. So he did want to know the secret Shield was keeping from him, but he still didn’t want Centipede to get it. 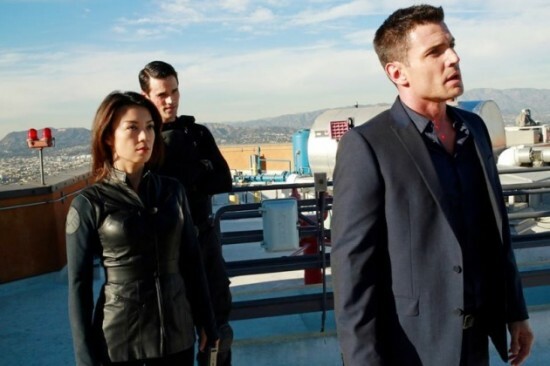 Skye and the rest of the team arrive at almost the same time and are able to save Coulson. Skye even punches out Raina. Back on the plane, Raina is being led away in handcuffs, and Hand is having a final meeting with Coulson. Hand tells Coulson that Centipede operations around the world are being taken down. Coulson thanks the team for saving him, and even disengages Skye’s punishment bracelet. A man is getting into his car, and finds Coulson in his back seat. It’s the doctor who operated on him, and Coulson wants to know what happened. The doctor (quite willingly) tells him he was dead for days. He wasn’t brought in to consult until after the 7th surgery on Coulson, and all the brainwork they were doing on him was to give him happy memories and his will to live back. He admits that Coulson suffered ungodly trauma, and that he was truly sorry. Coulson disappears almost as quickly as he arrived. After the commercial, we see a man in bed with the Centipede serum in his badly burned arms. Surprise, Peterson is not dead, even though we basically watched him blow up last episode. He is badly burned, and missing part of one of his legs. He looks at himself in the mirror, and we see some words come across the screen. He’s had one of the “evil eyes” implanted. Just like the Marvel movies, never stop watching when you think it’s over. This is one of those episodes that I imagine would anger a lot of the (already) disgruntled comic fans out there. I’ve heard a lot of noise about how this show is no good and has no direction. This focused a lot of Coulson’s personal issues and non-agent business, and that probably isn’t for everyone. But I really enjoyed it. For a long running series, you have to have the “monster of the week” type story as well as an overarching storyline that is addressed a little at a time. True, in this case, the overarching story is mostly Coulson and Skye’s personal missions, but for a mainstream show to be successful, it has to have something for everyone.